I can tell you exactly where I was, sitting in my SAT prep class at Randolph High School, when I first heard about the Virginia Tech shooting. I can tell you the very desk I was sitting at, in the library at Syracuse University, when I first heard about the Sandy Hook shooting. I can even tell you exactly how I felt -- sick to my stomach and helpless -- sweating, as I attempted to fathom that someone shot and murdered 26 people including 20 first-grade children at Sandy Hook Elementary School on December 14, 2012. What scares me the most is with more recent attacks, I'm beginning to forget. I can't tell you where I was when I heard about the Umpqua Community College shooting, or the San Bernardino shooting. These tragedies, that are as horrific as the next, are beginning to leave me numb. I'm scared that we as a country will accept these horrific acts as a norm, grieve or post on Facebook about it for a week, and then move on until it happens again. No one wants it to happen again. I don't want to continue to feel numb. 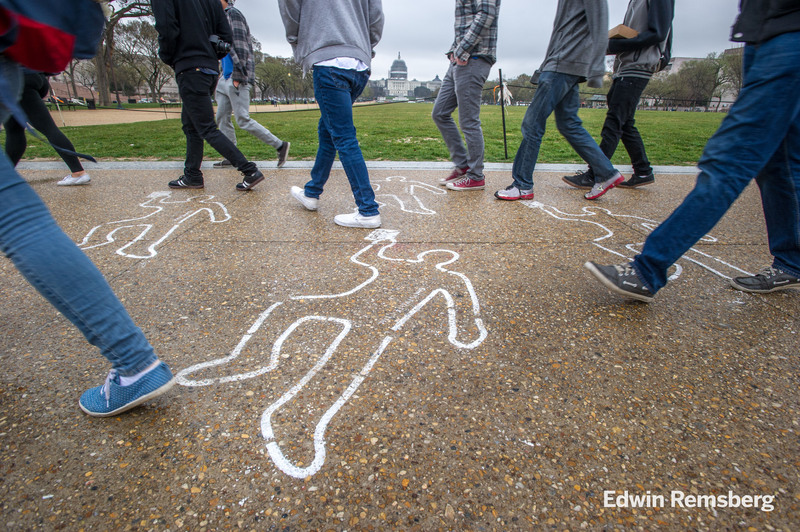 To bring awareness to this national gun epidemic, States United to Prevent Gun Violence Action Fund, Inc. and the Newtown Action Alliance launched #GhostVote in the nation's capital with a symbolic takeover -- placing body outlines featuring a #GhostVote ballot around the city to give a voice to those silenced by gun violence. The aim of this campaign is to put common sense gun laws at the top of the agenda leading up to the elections. The movement includes GhostVote.com, where supporters are encouraged to declare that they are "Ghost Voters" in honor of those killed by gun violence. Leah Gunn Barrett, Executive Director of New Yorkers Against Gun Violence, lost her brother, Greg Gaines Gunn, in 1997. Featured as one of the victims in the campaign, Greg was shot in the head and murdered at his family business. "We have no problem sharing our loved one's images in this campaign because every single day I'm haunted by my brother's loss; his children are haunted, and his new grandchild will be haunted by not having his grandfather around," Barrett says. Guns are designed very effectively to kill. And they do kill, 92 Americans a day. Barrett explains, "The #GhostVote hopes to get American citizens and legislators to think about the human cost to this entirely preventable epidemic that we seem to be happy to live with." For the past couple of years, Barrett and her organization have been pushing to pass a statewide firearm safe storage law in New York. Currently the only state that has a law like this is Massachusetts. This law essentially defines the term common sense. "It simply requires people to lock up their guns when they're not in their immediate possession. It's very simple really, you'd think this would already be a law but it's not," she says. Po Murray, Chairman of Newtown Action Alliance, formed the volunteer organization after the Sandy Hook shooting occurred over three years ago. Having four children that went through Sandy Hook Elementary School, the shooting drove Murray to take action. None of her children were in the school when the shooting occurred, but the event still hit too close to home: "I lived around the corner from the shooter. We also lost neighbors, young children," she explains. Murray says, "It's still hard to believe that it actually happened. If you ever visited Newtown, it's one of the safest places, major rural suburbia." The Newtown Action Alliance was formed to increase awareness and works to pass common sense gun laws. The organization holds vigils for all victims to gun violence in Washington D.C. While on Capital Hill, they attend rallies and hand deliver letters to legislators. The National Rifle Association (NRA) has 5 million members with the ultimate goal to sell more guns. "I'm mystified as to why congress doesn't want to work on this issue. Actually I know why -- because they are in the pockets of the NRA," Barrett says. The NRA is currently trying to pass a law in 15 states that will allow guns on campuses. "The sad thing is they [NRA] fight these gun violence laws because they profit from dangerous people owning guns. They instill fear that you need to arm yourself, to protect yourself from the criminal. It's a marketing ploy," Murray explains. Barrett stresses, "We have to be passionate, and more passionate because we are speaking for people who lost their voices. And for the Americans in the future who will lose their voices if we don't do something about this problem. More people are going to continue to die. It will just continue to happen." It's a national tragedy. We need to speak up and not be bystanders in this epidemic. It starts with our legislators. Mass shootings and gun violence shouldn't be something that Americans are accustomed to seeing on television weekly, if not daily. Mass shootings will not be the next trending topic. Murray leaves me with this, "The thing is, it may not happen to you, but it can. If it can happen in an elementary school, or a church, a movie theater, it certainly can affect you at some point in your life. It's scary to raise our children in this type of environment and we shouldn't have to live in fear."